Nalanda (Skt. Nālandā) was a Mahavihara, a large Buddhist monastery, in the ancient kingdom of Magadha (modern-day Bihar) in India. The site is located about 95 kilometres (59 mi) southeast of Patna near the town of Bihar Sharif, and was a centre of learning from the fifth century CE to c. 1200 CE. It is a UNESCO World Heritage Site. The highly formalized methods of Vedic learning helped inspire the establishment of large teaching institutions such as Taxila, Nalanda, and Vikramashila which are often characterised as India's early universities. Nalanda flourished under the patronage of the Gupta Empire in the 5th and 6th centuries and later under Harsha, the emperor of Kannauj. The liberal cultural traditions inherited from the Gupta age resulted in a period of growth and prosperity until the ninth century. The subsequent centuries were a time of gradual decline, a period during which the tantric developments of Buddhism became most pronounced in eastern India under the Pala Empire. At its peak, the school attracted scholars and students from near and far with some travelling from Tibet, China, Korea, and Central Asia. Archaeological evidence also notes contact with the Shailendra dynasty of Indonesia, one of whose kings built a monastery in the complex. Much of our knowledge of Nalanda comes from the writings of pilgrim monks from East Asia such as Xuanzang and Yijing who travelled to the Mahavihara in the 7th century. Vincent Smith remarked that "a detailed history of Nalanda would be a history of Mahayanist Buddhism". Many of the names listed by Xuanzang in his travelogue as products of Nalanda are the names of those who developed the philosophy of Mahayana. All students at Nalanda studied Mahayana as well as the texts of the eighteen (Hinayana) sects of Buddhism. Their curriculum also included other subjects such as the Vedas, logic, Sanskrit grammar, medicine and Samkhya. Nalanda was very likely ransacked and destroyed by an army of the Mamluk Dynasty of the Delhi Sultanate under Bakhtiyar Khilji in c. 1200 CE. While some sources note that the Mahavihara continued to function in a makeshift fashion for a while longer, it was eventually abandoned and forgotten until the 19th century when the site was surveyed and preliminary excavations were conducted by the Archaeological Survey of India. Systematic excavations commenced in 1915 which unearthed eleven monasteries and six brick temples neatly arranged on grounds 12 hectares (30 acres) in area. A trove of sculptures, coins, seals, and inscriptions have also been discovered in the ruins many of which are on display in the Nalanda Archaeological Museum situated nearby. Nalanda is now a notable tourist destination and a part of the Buddhist tourism circuit. A number of theories exist about the etymology of the name, Nālandā. According to the Tang Dynasty Chinese pilgrim, Xuanzang, it comes from Na al,lllam dā meaning no end in gifts or charity without intermission. Yijing, another Chinese traveller, however, derives it from Nāga Nanda referring to the name (Nanda) of a snake (naga) in the local tank. 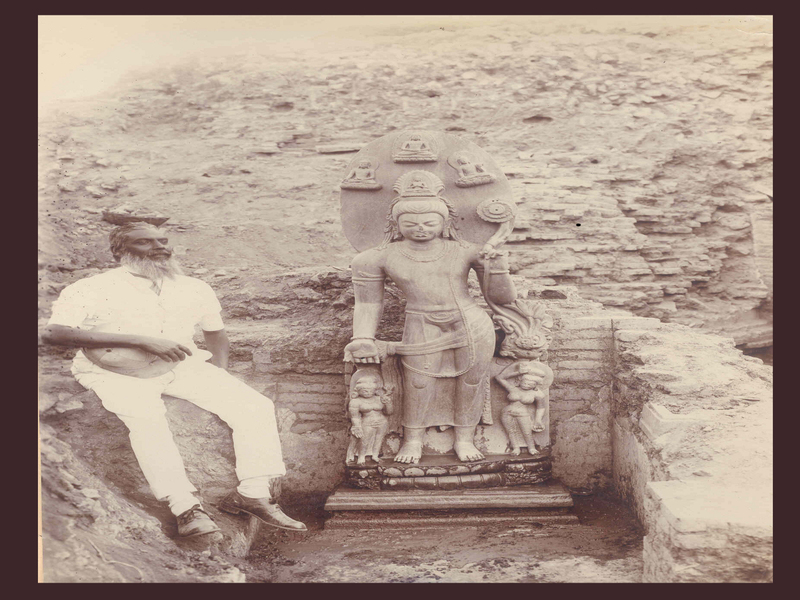 Hiranand Sastri, an archaeologist who headed the excavation of the ruins, attributes the name to the abundance of nālas (lotus-stalks) in the area and believes that Nalanda would then represent the giver of lotus-stalks. Nalanda was initially a prosperous village by a major trade route that ran through the nearby city of Rajagriha (modern Rajgir) which was then the capital of Magadha. It is said that the Jain thirthankara, Mahavira, spent 14 rainy seasons at Nalanda. Gautama Buddha too is said to have delivered lectures in a nearby mango grove named Pavarika and one of his two chief disciples, Shariputra, was born in the area and later attained nirvana there. This traditional association with Mahavira and Buddha tenuously dates the existence of the village to at least the 5th–6th century BCE. Not much is known of Nalanda in the centuries hence. Taranatha, the 17th-century Tibetan Lama, states that the 3rd-century BCE Mauryan and Buddhist emperor, Ashoka, built a great temple at Nalanda at the site of Shariputra's chaitya. He also places 3rd-century CE luminaries such as the Mahayana philosopher, Nagarjuna, and his disciple, Aryadeva, at Nalanda with the former also heading the institution. Taranatha also mentions a contemporary of Nagarjuna named Suvishnu building 108 temples at the location. While this could imply that there was a flourishing centre for Buddhism at Nalanda before the 3rd century, no archaeological evidence has been unearthed to support the assertion. When Faxian, an early Chinese Buddhist pilgrim to India, visited Nalo, the site of Shariputra's parinirvana, at the turn of the 5th century CE, all he found worth mentioning was a stupa. Nalanda's datable history begins under the Gupta Empire[page needed] and a seal identifies a monarch named Shakraditya (Śakrāditya) as its founder. Both Xuanzang and a Korean pilgrim named Prajnyavarman (Prajñāvarman) attribute the foundation of a sangharama (monastery) at the site to him. Shakraditya is identified with the 5th-century CE Gupta emperor, Kumaragupta I (r. c. 415 – c. 455 CE– ), whose coin has been discovered at Nalanda. His successors, Buddhagupta, Tathagatagupta, Baladitya, and Vajra, later extended and expanded the institution by building additional monasteries and temples. The Guptas were traditionally a Brahmanical dynasty. They built a sangharama at Nalanda and also a 300 ft (91 m) high vihara with a Buddha statue within which, according to Xuanzang, resembled the "great Vihara built under the Bodhi tree". The Chinese monk also noted that Baladitya's son, Vajra, who commissioned a sangharama as well, "possessed a heart firm in faith". The post-Gupta period saw a long succession of kings who continued building at Nalanda "using all the skill of the sculptor". At some point, a "king of central India" built a high wall along with a gate around the now numerous edifices in the complex. Another monarch (possibly of the Maukhari dynasty) named Purnavarman who is described as "the last of the race of Ashoka-raja", erected an 80 ft (24 m) high copper image of Buddha to cover which he also constructed a pavilion of six stages. However, after the decline of the Guptas, the most notable patron of the Mahavihara was Harsha, the 7th-century emperor of Kannauj. Harsha was a converted Buddhist and considered himself a servant of the monks of Nalanda. He built a monastery of brass within the Mahavihara and remitted to it the revenues of 100 villages. He also directed 200 households in these villages to supply the institution's monks with requisite amounts of rice, butter, and milk on a daily basis. Around a thousand monks from Nalanda were present at Harsha's royal congregation at Kannauj. Much of what is known of Nalanda before the 8th century is based on the travelogues of the Chinese monks, Xuanzang (Si-Yu-Ki) and Yijing (A Record of the Buddhist Religion As Practised in India and the Malay Archipelago). 8th century Dunhuang cave mural depicts Xuanzang returning from India. Xuanzang (also known as Hiuen Tsang) travelled around India between the years of 630 and 643 CE, and visited Nalanda first in 637 and then again in 642, spending a total of around two years at the monastery. He was warmly welcomed in Nalanda where he received the Indian name of Mokshadeva and studied under the guidance of Shilabhadra, the venerable head of the institution at the time. He believed that the aim of his arduous overland journey to India had been achieved as in Shilabhadra he had at last found an incomparable teacher to instruct him in Yogachara, a school of thought that had then only partially been transmitted to China. Besides Buddhist studies, the monk also attended courses in grammar, logic, and Sanskrit, and later also lectured at the Mahavihara. Xuanzang was a contemporary and an esteemed guest of Harsha and catalogued the emperor's munificence in some detail. According to Xuanzang's biographer, Hwui-Li, Nalanda was held in contempt by some Sthaviras for its emphasis on Mahayana philosophy. They reportedly chided King Harsha for patronising Nalanda during one of his visits to Odisha, mocking the "sky-flower"[clarification needed] philosophy taught there and suggesting that he might as well patronise a Kapalika temple. When this occurred, Harsha notified the chancellor of Nalanda, who sent the monks Sagaramati, Prajnyarashmi, Simharashmi, and Xuanzang to refute the views of the monks from Odisha. A map of Nalanda and its environs from Alexander Cunningham's 1861–62 ASI report which shows a number of ponds (pokhar) around the Mahavihara. Inspired by the journeys of Faxian and Xuanzang, the pilgrim, Yijing (also known as I-tsing), after studying Sanskrit in Srivijaya, arrived in India in 673 CE. He stayed there for fourteen years, ten of which he spent at the Nalanda Mahavihara. When he returned to China in 695, he had with him 400 Sanskrit texts which were subsequently translated. Unlike his predecessor, Xuanzang, who also describes the geography and culture of 7th-century India, Yijing's account primarily concentrates on the practice of Buddhism in the land of its origin and detailed descriptions of the customs, rules, and regulations of the monks at the monastery. In his chronicle, Yijing notes that revenues from 200 villages (as opposed to 100 in Xuanzang's time) had been assigned toward the maintenance of Nalanda. He described there being eight halls with as many as 300 apartments. According to him, daily life at Nalanda included a series of rites that were followed by all. Each morning, a bell was rung signalling the bathing hour which led to hundreds or thousands of monks proceeding from their viharas towards a number of great pools of water in and around the campus where all of them took their bath. This was followed by another gong which signalled the ritual ablution of the image of the Buddha. The chaityavandana was conducted in the evenings which included a "three-part service", the chanting of a prescribed set of hymns, shlokas, and selections from scriptures. While it was usually performed at a central location, Yijing states that the sheer number of residents at Nalanda made large daily assemblies difficult. This resulted in an adapted ritual which involved a priest, accompanied by lay servants and children carrying incense and flowers, travelling from one hall to the next chanting the service. The ritual was completed by twilight. The Palas established themselves in North-eastern India in the 8th century and reigned until the 12th century. Although they were a Buddhist dynasty, Buddhism in their time was a mixture of the Mahayana practised in Nalanda and Vajrayana, a Tantra-influenced version of Mahayanist philosophy. Nalanda was a cultural legacy from the great age of the Guptas and it was prized and cherished. The Palas were prolific builders and their rule oversaw the establishment of four other Mahaviharas modelled on the Nalanda Mahavihara at Jagaddala, Odantapura, Somapura, and Vikramashila respectively. Remarkably, Odantapura was founded by Gopala, the progenitor of the royal line, only 6 miles (9.7 km) away from Nalanda. Inscriptions at Nalanda suggest that Gopala's son, Dharmapala, who founded the Mahavihara at Vikramshila, also appears to have been a benefactor of the ancient monastery in some form. It is however, Dharmapala's son, the 9th century emperor and founder of the Mahavihara at Somapura, Devapala, who appears to have been Nalanda's most distinguished patron in this age. A number of metallic figures containing references to Devapala have been found in its ruins as well as two notable inscriptions. The first, a copper plate inscription unearthed at Nalanda, details an endowment by the Shailendra King, Balaputradeva of Suvarnadvipa (Sumatra in modern-day Indonesia). This Srivijayan king, "attracted by the manifold excellences of Nalanda" had built a monastery there and had requested Devapala to grant the revenue of five villages for its upkeep, a request which was granted. The Ghosrawan inscription is the other inscription from Devapala's time and it mentions that he received and patronised a learned Vedic scholar named Viradeva who was later elected the head of Nalanda. The now five different seats of Buddhist learning in eastern India formed a state-supervised network and it was common for great scholars to move easily from position to position among them. Each establishment had its own official seal with a dharmachakra flanked by a deer on either side, a motif referring to Buddha's deer park sermon at Sarnath. Below this device was the name of the institution which in Nalanda's case read, "Śrī-Nālandā-Mahāvihārīya-Ārya-Bhikṣusaḿghasya" which translates to "of the Community of Venerable Monks of the Great Monastery at Nalanda". While there is ample epigraphic and literary evidence to show that the Palas continued to patronise Nalanda liberally, the Mahavihara was less singularly outstanding during this period as the other Pala establishments must have drawn away a number of learned monks from Nalanda. The Vajrayana influence on Buddhism grew strong under the Palas and this appears to have also had an effect on Nalanda. What had once been a centre of liberal scholarship with a Mahayanist focus grew more fixated with Tantric doctrines and magic rites. Taranatha's 17th-century history claims that Nalanda might have even been under the control of the head of the Vikramshila Mahavihara at some point. While its excavated ruins today only occupy an area of around 1,600 feet (488 m) by 800 feet (244 m) or roughly 12 hectares, Nalanda Mahavihara occupied a far greater area in medieval times. Xuanzang left detailed accounts of the school in the 7th century. He described how the regularly laid-out towers, forest of pavilions, harmikas and temples seemed to "soar above the mists in the sky" so that from their cells the monks "might witness the birth of the winds and clouds". The pilgrim states: "An azure pool winds around the monasteries, adorned with the full-blown cups of the blue lotus; the dazzling red flowers of the lovely kanaka hang here and there, and outside groves of mango trees offer the inhabitants their dense and protective shade." 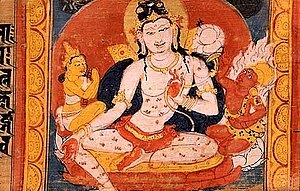 Avalokiteshvara Bodhisattva. Ashtasahasrika Prajnyaparamita Sutra manuscript from Nalanda's Pala period. It is evident from the large numbers of texts that Yijing carried back with him after his 10-year residence at Nalanda, that the Mahavihara must have featured a well-equipped library. Traditional Tibetan sources mention the existence of a great library at Nalanda named Dharmaganja (Piety Mart) which comprised three large multi-storeyed buildings, the Ratnasagara (Ocean of Jewels), the Ratnodadhi (Sea of Jewels), and the Ratnaranjaka (Jewel-adorned). Ratnodadhi was nine storeys high and housed the most sacred manuscripts including the Prajnyaparamita Sutra and the Guhyasamaja. The exact number of volumes in the Nalanda library is not known. But it is estimated to have been in the hundreds of thousands. The library not only collected religious manuscripts but also had texts on such subjects as grammar, logic, literature, astrology, astronomy, and medicine. [page needed] The Nalanda library must have had a classification scheme which was possibly based on a text classification scheme developed by the Sanskrit linguist, Panini. Buddhist texts were most likely divided into three classes based on the Tripitaka's three main divisions: the Vinaya, Sutra, and the Abhidhamma. In his biography of Xuanzang, Hwui-Li states that all the students of Nalanda studied the Great Vehicle (Mahayana) as well as the works of the eighteen (Hinayana) sects of Buddhism. In addition to these, they studied other subjects such as the Vedas, Hetuvidyā (Logic), Shabdavidya (Grammar and Philology), Chikitsavidya (Medicine), the works on magic (the Atharvaveda), and Samkhya. Xuanzang himself studied a number of these subjects at Nalanda under Shilabhadra and others. Besides Theology and Philosophy, frequent debates and discussions necessitated competence in Logic. A student at the Mahavihara had to be well-versed in the systems of Logic associated with all the different schools of thought of the time as he was expected to defend Buddhist systems against the others. Other subjects believed to have been taught at Nalanda include law, astronomy, and city-planning. In the 7th century, Xuanzang recorded the number of teachers at Nalanda as being around 1510. Of these, approximately 1000 were able to explain 20 collections of sutras and shastras, 500 were able to explain 30 collections, and only 10 teachers were able to explain 50 collections. Xuanzang was among the few who were able to explain 50 collections or more. At this time, only the abbot Shilabhadra had studied all the major collections of sutras and shastras at Nalanda. If the monks had some business, they would assemble to discuss the matter. Then they ordered the officer, Vihārpāl, to circulate and report the matter to the resident monks one by one with folded hands. With the objection of a single monk, it would not pass. There was no use of beating or thumping to announce his case. In case a monk did something without consent of all the residents, he would be forced to leave the monastery. If there was a difference of opinion on a certain issue, they would give reason to convince (the other group). No force or coercion was used to convince. The lives of all these virtuous men were naturally governed by habits of the most solemn and strictest kind. Thus in the seven hundred years of the monastery's existence no man has ever contravened the rules of the discipline. The king showers it with the signs of his respect and veneration and has assigned the revenue from a hundred cities to pay for the maintenance of the religious. A vast amount of what came to comprise Tibetan Buddhism, both its Mahayana and Vajrayana traditions, stems from the teachers and traditions at Nalanda. Shantarakshita, who pioneered the propagation of Buddhism in Tibet in the 8th century was a scholar of Nalanda. He was invited by the Tibetan king, Khri-sron-deu-tsan, and established the monastery at Samye, serving as its first abbot. He and his disciple Kamalashila (who was also of Nalanda) essentially taught Tibetans how to do philosophy. Padmasambhava, who was also invited from Nalanda Mahavihara by the king in 747 CE, is credited as a founder of Tibetan Buddhism. The scholar Dharmakirti (c. 7th century), one of the Buddhist founders of Indian philosophical logic, as well as one of the primary theorists of Buddhist atomism, taught at Nalanda. Other forms of Buddhism, such as the Mahayana Buddhism followed in Vietnam, China, Korea and Japan, flourished within the walls of the ancient school. A number of scholars have associated some Mahayana texts such as the Shurangama Sutra, an important sutra in East Asian Buddhism, with the Buddhist tradition at Nalanda. Ron Epstein also notes that the general doctrinal position of the sutra does indeed correspond to what is known about the Buddhist teachings at Nalanda toward the end of the Gupta period when it was translated. Several Buddhist institutions overseas have chosen to call themselves Nalanda to acknowledge Nalanda's influence. These include Nalanda Buddhist Society in Malaysia and Nalanda College, Colombo, Sri Lanka, Nalanda Buddhist Education Foundation, Indonesia. Traditional sources state that Nalanda was visited by both Mahavira and the Buddha in c. 6th and 5th century BCE. It is also the place of birth and nirvana of Shariputra, one of the famous disciples of Buddha. The decline of Nalanda is concomitant with the disappearance of Buddhism in India. When Xuanzang travelled the length and breadth of India in the 7th century, he observed that his religion was in slow decay and even had ominous premonitions of Nalanda's forthcoming demise. Buddhism had steadily lost popularity with the laity and thrived, thanks to royal patronage, only in the monasteries of Bihar and Bengal. By the time of the Palas, the traditional Mahayana and Hinayana forms of Buddhism were imbued with Tantric practices involving secret rituals and magic. The rise of Hindu philosophies in the subcontinent and the waning of the Buddhist Pala dynasty after the 11th century meant that Buddhism was hemmed in on multiple fronts, political, philosophical, and moral. The final blow was delivered when its still-flourishing monasteries, the last visible symbols of its existence in India, were overrun during the Muslim invasion that swept across Northern India at the turn of the 13th century. 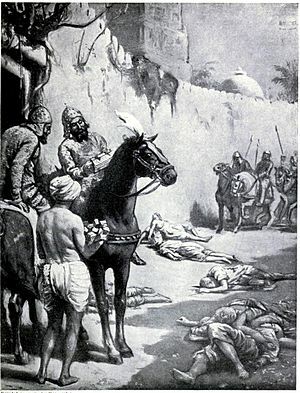 Muhammad-i-Bakht-yar, by the force of his intrepidity, threw himself into the postern of the gateway of the place, and they captured the fortress, and acquired great booty. The greater number of the inhabitants of that place were Brahmans, and the whole of those Brahmans had their heads shaven; and they were all slain. There were a great number of books there; and, when all these books came under the observation of the Musalmans, they summoned a number of Hindus that they might give them information respecting the import of those books; but the whole of the Hindus had been killed. On becoming acquainted [with the contents of those books], it was found that the whole of that fortress and city was a college, and in the Hindui tongue, they call a college [مدرسه] Bihar. This passage refers to an attack on a Buddhist monastery (the "Bihar" or Vihara) and its monks (the shaved Brahmans). The exact date of this event is not known with scholarly estimates ranging from 1197 to 1206. While many historians believe that this monastery which was mistaken for a fort was Odantapura, some are of the opinion that it was Nalanda itself. However, considering that these two Mahaviharas were only a few kilometres apart, both very likely befell a similar fate. The other great Mahaviharas of the age such as Vikramshila and later, Jagaddala, also met their ends at the hands of the Turks at around the same time. Another important account of the times is the biography of the Tibetan monk-pilgrim, Dharmasvamin, who journeyed to India between 1234 and 1236. When he visited Nalanda in 1235, he found it still surviving, but a ghost of its past existence. Most of the buildings had been damaged by the Muslims and had since fallen into disrepair. But two viharas, which he named Dhanaba and Ghunaba, were still in serviceable condition with a 90-year-old teacher named Rahula Shribhadra instructing a class of about 70 students on the premises. Dharmasvamin believed that the Mahavihara had not been completely destroyed for superstitious reasons as one of the soldiers who had participated in the desecration of a Jnananatha temple in the complex had immediately fallen ill. While he stayed there for six months under the tutelage of Rahula Shribhadra, Dharmasvamin makes no mention of the legendary library of Nalanda which possibly did not survive the initial wave of Turkic attacks. He, however, provides an eyewitness account of an attack on the derelict Mahavihara by the Muslim soldiers stationed at nearby Odantapura (now Bihar Sharif) which had been turned into a military headquarters. Only the Tibetan and his nonagenarian instructor stayed behind and hid themselves while the rest of the monks fled Nalanda. Contemporary sources end at this point. But traditional Tibetan works which were written much later suggest that Nalanda's story might have managed to endure for a while longer even if the institution was only a pale shadow of its former glory. The Lama, Taranatha, states that the whole of Magadha fell to the Turks who destroyed many monasteries including Nalanda which suffered heavy damage. He however also notes that a king of Bengal named Chagalaraja and his queen later patronised Nalanda in the fourteenth and fifteenth centuries, although no major work was done there. An 18th-century work named Pag sam jon zang recounts another Tibetan legend which states that chaityas and viharas at Nalanda were repaired once again by a Buddhist sage named Mudita Bhadra and that Kukutasiddha, a minister of the reigning king, erected a temple there. A story goes that when the structure was being inaugurated, two indignant (Brahmanical) Tirthika mendicants who had appeared there were treated with disdain by some young novice monks who threw washing water at them. In retaliation, the mendicants performed a 12-year penance propitiating the sun, at the end of which they performed a fire-sacrifice and threw "living embers" from the sacrificial pit into the Buddhist temples. The resulting conflagration is said to have hit Nalanda's library. Fortunately, a miraculous stream of water gushed forth from holy manuscripts in the ninth storey of Ratnodadhi which enabled many manuscripts to be saved. The heretics perished in the very fire that they had kindled. While it is unknown when this event was supposed to have occurred, archaeological evidence (including a small heap of burnt rice) does suggest that a large fire did consume a number of structures in the complex on more than one occasion. A stone inscription notes the destruction by fire and subsequent restoration at the Mahavihara during the reign of Mahipala (r. 988–1038). Johan Elverskog, a scholar of Central Asia, Islam and Buddhism, professor and chair of religious studies at SMU, looking at the wider reasons for Nalanda's cline as cultural centre, and how it's used in certain anti-Islamic rhetorics, talks of local Buddhists making deals with Muslim rulers early on, which assured that Buddhic activities in Nalanda went on for centuries : he says that one Indian master "was trained and ordained at Nalanda before he traveled to the court of Khubilai Khan", Chinese monks were travelling there to get texts as late as the fourteenth century, and concludes that "the Dharma survived in India at least until the seventeenth century." He mainly blames British historiography, which used these "claims of Muslim barbarity and misrule in order to justify the introduction of their supposedly more humane and rational form of colonial rule", a view which "is readily perpetuated in the rhetoric of today’s Hindu nationalists who want to re-create some imagined Hindu utopia by eradicating all traces of Islam in India, by violence if necessary." The last throne-holder of Nalanda, Shakyashri Bhadra of Kashmir, fled to Tibet in 1204 at the invitation of the Tibetan translator Tropu Lotsawa (Khro-phu Lo-tsa-ba Byams-pa dpal). Some of the surviving Nalanda books were taken by fleeing monks to Tibet. He took with him several Indian masters: Sugataśrī, (an expert in Madhyamaka and Prajñāpāramitā); Jayadatta (Vinaya); Vibhūticandra (grammar and Abhidharma), Dānaśīla (logic), Saṅghaśrī (Candavyākaraṇa), Jīvagupta (books of Maitreya), Mahābodhi,(Bodhicaryāvatāra); and Kālacandra (Kālacakra). The Dalai Lama refers to himself as a follower of the lineage of the seventeen Nalanda masters. An Astasahasrika Prajnaparamita Sutra manuscript preserved at the Tsethang monastery has superbly painted and well preserved wooden covers and 139 leaves. According to its colophon it was donated by the mother of the great pandita Sri Asoka in the second year of the reign of King Surapala, at the very end of the 11th century. Excavated ruins of the monasteries of Nalanda. After its decline, Nalanda was largely forgotten until Francis Buchanan-Hamilton surveyed the site in 1811–1812 after locals in the vicinity drew his attention to a vast complex of ruins in the area. He, however, did not associate the mounds of earth and debris with famed Nalanda. That link was established by Major Markham Kittoe in 1847. Alexander Cunningham and the newly formed Archaeological Survey of India conducted an official survey in 1861–1862. Systematic excavation of the ruins by the ASI did not begin until 1915 and ended in 1937. A second round of excavation and restoration took place between 1974 and 1982. The remains of Nalanda today extend some 1,600 feet (488 m) north to south and around 800 feet (244 m) east to west. Excavations have revealed eleven monasteries and six major brick temples arranged in an ordered layout. A 100 ft (30 m) wide passage runs from north to south with the temples to its west and the monasteries to its east. Most structures show evidence of multiple periods of construction with new buildings being raised atop the ruins of old ones. Many of the buildings also display signs of damage by fire on at least one occasion. The map give the layout of the excavated structures. Temple 3 in the south was the most imposing structure. Temple 12, 13, 14 face the monasteries and face east. With the exception of those designated 1A and 1B, the monasteries all face west with drains emptying out in the east and staircases positioned in the south-west corner of the buildings. Temple 2 was to the east. All the monasteries at Nalanda are very similar in layout and general appearance. Their plan involves a rectangular form with a central quadrangular court which is surrounded by a verandah which, in turn, is bounded by an outer row of cells for the monks. The central cell facing the entrance leading into the court is a shrine chamber. Its strategic position means that it would have been the first thing that drew the eye when entering the edifice. With the exception of those designated 1A and 1B, the monasteries all face west with drains emptying out in the east and staircases positioned in the south-west corner of the buildings. Monastery 1 is considered the oldest and the most important of the monastery group and shows as many as nine levels of construction. Its lower monastery is believed to be the one sponsored by Balaputradeva, the Srivijayan king, during the reign of Devapala in the 9th century (see Nalanda copper-plate of Devapala). The building was originally at least 2 storeys high and contained a colossal statue of a seated Buddha. Temple no. 3 (also termed Sariputta Stupa) is the most iconic of Nalanda's structures with its multiple flights of stairs that lead all the way to the top. The temple was originally a small structure which was built upon and enlarged by later constructions. Archaeological evidence shows that the final structure was a result of at least seven successive such accumulations of construction. The fifth of these layered temples is the most interesting and the best preserved with four corner towers of which three have been exposed. The towers as well as the sides of the stairs are decorated with exquisite panels of Gupta-era art depicting a variety of stucco figures including Buddha and the Bodhisattvas, scenes from the Jataka tales. The temple is surrounded by numerous votive stupas some of which have been built with bricks inscribed with passages from sacred Buddhist texts. The apex of Temple no. 3 features a shrine chamber which now only contains the pedestal upon which an immense statue of Buddha must have once rested. According to Win Maung, the stupa was derived from the early Kushana type and in turn influenced Gwe Bin Tet Kon (Sri Khettara) stupa in Myanmar. In a shrine near the bottom of the staircase, a large image of Avalotiteshvar was found which was eventually moved to the Museum. Temple no. 2 notably features a dado of 211 sculptured panels depicting a variety of religious motifs such as Shiva, Parvati, Kartikeya, and Gajalakshmi, Kinnaras playing musical instruments, various representations of Makaras, as well as human couples in amorous postures, as well as scenes of art and of everyday life. It has been suggested that Temple 2 was of Brahmanical affiliation, however that is not settled. The site of Temple no. 13 features a brick-made smelting furnace with four chambers. The discovery of burnt metal and slag suggests that it was used to cast metallic objects. To the north of Temple 13 lie the remains of Temple no. 14. An enormous image of the Buddha was discovered here. The image's pedestal features fragments of the only surviving exhibit of mural painting at Nalanda. To the east of Temple 2, lie the remains of Sarai Temple in the recently excavated Sarai Mound. This multi-storeyed Buddhist temple with many stupas and shrines was enclosed by a massive wall enclosure. The remains in the sanctum suggest that the Buddha statue was around eighty feet high. Numerous sculptures, murals, copper plates, inscriptions, seals, coins, plaques, potteries and works in stone, bronze, stucco and terracotta have been unearthed within the ruins of Nalanda. The Buddhist sculptures discovered notably include those of the Buddha in different postures, Avalokiteshvara, Jambhala, Manjushri, Marichi, and Tara. Brahmanical idols of Vishnu, Shiva-Parvathi, Ganesha, Mahishasura Mardini, and Surya have also been found in the ruins. A modern temple termed the Black Buddha temple (termed by locals as the Telia Bhairav, "tel" refers to use of oil as a protective coating) has emerged near Temple 14 with has a ancient large black Buddha image in bhumisparha mudra.This the same temple termed Baithak Bhairab in Cunningham's 1861–62 ASI report (See "A map of Nalanda and its environs from Alexander Cunningham's 1861–62 ASI report" above), suggesting that the Buddha image was in worship by the locals even then, suggesting a continuity of religious activity in the ruins of Nalanda. Replicas of the Black Buddha image have been installed in temples in Thailand. It is notable that the temple is outside of the ASI protected area, presumable because was in active worship before ASI took control. In nearby villages, such as Ghosrawan, Sarilchak, Mustafpur, Jagdishpur, there are several Buddha images in active worship by the local people. Some of the statues have been stolenand some have been deliberately vandalized. Los Angeles County Museum of Art Folios from a Dharanisamgraha, circa 1075. Asia Society This Ashtasahasrika Prajnaparamita manuscript records, in Sanskrit and Tibetan, the history of the manuscript from its creation at the famous Nalanda monastery in India through its use in Tibet by the compiler of the first Tibetan canon of Buddhism, Buton. Yarlung Museum, Tsetang (From the On ke ru Lha khang monastery) Astasahahasrika Prajnaparamita Sanskrit palm-leaf manuscript, with 139 leaves and painted wooden covers. According to the colophon the this manuscript was donated by the mother of the great pandita Sri Asoka in the second year of the reign of King Surapala, at end of the 11th century. Son of a minister of Yashovarman donated to the temple built by king Baladitya. 8th cent CE, basalt slab found in monastery 1. Murnavarman constructed a 24.3 meter high brass image of Buddha. 7th cent CE, basalt slab, found in Sarai mound. Monk Vipulshrimitra built a monastery. Basalt slab, later half of 12th cent, found in the uppermost level of Monastery 7. Donation of Balaputradeva, the king of Suvarnadvipa of Sailendra dynasty. 860 CE Copperplate found by Hirananda Shastri in 1921 in the antechamber of Monastery 1 at Nalanda. In 1951, the Nava Nalanda Mahavihara (New Nalanda Mahavihara), a modern centre for Pali and Buddhism in the spirit of the ancient institution, was founded by the Government of Bihar near Nalanda's ruins at the suggestion of Dr. Rajendra Prasad, India's first president. It was deemed to be a university in 2006. September 1, 2014, saw the commencement of the first academic year of a modern Nalanda University, with 15 students, in nearby Rajgir. It has been established in a bid to revive the ancient seat of learning. The university has acquired 455 acres of land for its campus and has been allotted ₹2727 crores (around $454M) by the Indian government. It is also being funded by the governments of China, Singapore, Australia, Thailand, and others. Nalanda is a popular tourist destination in the state attracting a number of Indian and overseas visitors. It is also an important stop on the Buddhist tourism circuit. The Archaeological Survey of India maintains a museum near the ruins for the benefit of visitors. The museum exhibits the antiquities that have been unearthed at Nalanda as well as from nearby Rajgir. Out of 13,463 items, only 349 are on display in four galleries. The Xuanzang Memorial Hall is an Indo-Chinese undertaking to honour the famed Buddhist monk and traveller. A relic, comprising a skull bone of the Chinese monk, is on display in the memorial hall. Another museum adjoining the excavated site is the privately run Nalanda Multimedia Museum. It showcases the history of Nalanda through 3-D animation and other multimedia presentations. An ASI guide stone detailing the history of Nalanda. Jain Tirthankara, Bronze, from Nalanda, Bihar, dating from 10th century A.D.
↑ Scharfe 2002, p. 149. ↑ "Four sites inscribed on UNESCO's World Heritage List". whc.unesco.org. UNESCO World Heritage Centre. 15 July 2016. Archived from the original on 16 July 2016. Retrieved 15 July 2016. ↑ "Chandigarh's Capitol Complex makes it to UNESCO's World Heritage List". Economic Times. 18 July 2016. Archived from the original on 18 July 2016. Retrieved 18 July 2016. ↑ 4.0 4.1 4.2 Frazier 2011, p. 34. ↑ 5.0 5.1 5.2 Scharfe 2002, p. 148. ↑ 6.0 6.1 Monroe 2000, p. 174. ↑ 7.0 7.1 7.2 Wayman 1984, p. 43. ↑ Kulke & Rothermund 2004, p. 119. ↑ 9.0 9.1 Dutt 1962, p. 329. ↑ Dutt 1962, p. 344. ↑ Monroe 2000, pp. 169. ↑ 12.0 12.1 Dutt 1962, p. 334. ↑ 13.0 13.1 Dutt 1962, pp. 332–333. ↑ 14.0 14.1 Buswell & Lopez 2013, Entry for Nālandā. ↑ Walton 2015, p. 122. ↑ 16.0 16.1 16.2 Chandra 2004, p. 41. ↑ Ghosh 1965, pp. 3. ↑ Hiranand Sastri 1986, pp. 3–4. ↑ KA Nilakanta Sastri 1988, p. 268. ↑ Dutt 1962, p. 328. ↑ Ghosh 1965, p. 4. ↑ Monroe 2000, p. 166. ↑ 24.0 24.1 Ghosh 1965, p. 5. ↑ Dutt 1962, p. 330. ↑ 26.0 26.1 26.2 Scharfe 2002, p. 151. ↑ 27.0 27.1 Kulke & Rothermund 2004, p. 110. ↑ Wriggins 1996, p. 237. ↑ Ghosh 1965, p. 8. ↑ Wriggins 1996, p. 124. ↑ Beal 2000, p. 111. ↑ Joshi 1977, p. 171. ↑ Wriggins 1996, pp. 177. ↑ Ghosh 1965, p. 9. ↑ Scharfe 2002, p. 144. ↑ Monroe 2000, p. 167. ↑ Dutt 1962, pp. 128–130. ↑ Dutt 1962, pp. 349–352. ↑ Scharfe 2002, p. 152. ↑ Wink 2002, p. 268. ↑ Dutt 1962, p. 352. ↑ Ghosh 1965, p. 55. ↑ Dutt 1962, pp. 344–346. ↑ Ghosh 1965, p. 10. ↑ Garten, Jeffrey E. (9 December 2006). "Really Old School". Archived from the original on 5 November 2011. ↑ Grousset 1971, p. 158. ↑ 47.0 47.1 Grousset 1971, p. 159. ↑ Scharfe 2002, p. 159. ↑ Khurshid 1972, pp. 21–65. ↑ Patel & Kumar 2001, p. 4. ↑ Taher & Davis 1994, p. 37. ↑ Berzin, Alexander (2002). "The Four Indian Buddhist Tenet Systems Regarding Illusion". Archived from the original on 15 August 2016. Retrieved 11 July 2016. ↑ Mookerji 1998, p. 565. ↑ Walser 2005, p. 102. ↑ "Śāntarakṣita". Stanford Encyclopedia of Philosophy. Retrieved 4 October 2015. ↑ Ghosh 1965, p. 11. ↑ 58.0 58.1 Collins 2000, p. 240. ↑ Dutt 1962, p. 264. ↑ Humphreys 1987, p. 111. ↑ "The Shurangama Sutra (T. 945): A Reappraisal of its Authenticity". Archived from the original on 27 November 2010. ↑ Nalanda Buddhist Society, Sri Serdang, Selangor Archived 14 November 2017 at the Wayback Machine. ↑ About Nalanda College Archived 22 July 2017 at the Wayback Machine. ↑ Jarzombek, Prakash & Ching 2011, p. 312. ↑ Joshi 1977, p. 177. ↑ Wriggins 1996, p. 145. ↑ 68.0 68.1 Ghosh 1965, p. 13. ↑ Wink 2002, p. 333. ↑ Basham 1954, p. 266. ↑ Minhaj-ud-Din 1881, p. 552. ↑ Ghosh 1965, p. 14. ↑ Dutt 1962, pp. 157,379. ↑ Scharfe 2002, p. 150. ↑ 75.0 75.1 Chos-dar 1959, Introduction, p.XIX. ↑ Dutt 1962, p. 347. ↑ Dutt 1962, p. 343. ↑ Ghosh 1965, p. 15. ↑ Ghosh 1965, p. 56. ↑ Buddhist Arts of the Himalayas, Asia Society Archived 20 March 2012 at the Wayback Machine. ↑ Śākyaśrībhadra, b.1127 - d.1225, Alexander Gardner, July 2011 Archived 23 April 2016 at the Wayback Machine. ↑ The Seventeen Pandits of Nalanda Monastery, James Blumenthal, July-September 2012 Archived 20 November 2017 at the Wayback Machine. ↑ [http://www.asianart.com/articles/henss/index.html#14 TIBET – Monasteries Open Their Treasure Rooms – the exhibition and its book: A Review, Michael Henss, Asian Art, December 25, 2007] Archived 9 April 2009 at the Wayback Machine. ↑ Le 2010, p. 59. ↑ Ghosh 1965, p. 27. ↑ 90.0 90.1 Ghosh 1965, p. 28. ↑ Ghosh 1965, p. 19. ↑ Ghosh 1965, p. 17. ↑ THE ANCESTRAL STUPAS OF SHWEDAGON, International Buddhist Conference, May 2007 Archived 29 November 2016 at the Wayback Machine. ↑ Nalanda archival-4 Archived 1 December 2017 at the Wayback Machine. ↑ Ghosh 1965, p. 31–33. ↑ Excavations At Nalanda, UNESCO World Heritage Centre, 2014-07-11 Archived 9 November 2017 at the Wayback Machine. ↑ NALANDA: The Other side of its history, Suresh Bhatia, 01 October 2009 Archived 15 January 2015 at the Wayback Machine. ↑ Black Buddha Nalanda Bihar India, Phra Ajahn Withoon Putamee, Oct 7, 2013 Archived 10 May 2018 at the Wayback Machine. ↑ หลวงพ่อองค์ดำ นาลันทา อินเดีย, Eing Eing Siddhini Kittisiddho, May 2, 2012 Archived 10 May 2018 at the Wayback Machine. ↑ ประวัติหลวงพ่อองค์ดำวัดกลันทาราม, โชติปภัสส์ ก่อแก้ว, Feb 13, 2016 Archived 10 May 2018 at the Wayback Machine. ↑ พระพุทธชยันตีองค์ดำนาลันทา(01A) เสถียรธรรมสถาน SDS Channel, May 25, 2012 Archived 10 May 2018 at the Wayback Machine. ↑ The Expanse of Archaeological Remains at Nalanda: A Study Using remote sensing, MB Rajani, Archive of Asian Art, V 66, No. 1, pp. 1-23, 2016 Archived 14 November 2017 at the Wayback Machine. ↑ Buddhist circuit of Bihar, Archived 1 August 2017 at the Wayback Machine. ↑ Stolen Buddha statue back to village, ALOK KUMAR, The Telegraph, December 1 , 2014 Archived 8 November 2017 at the Wayback Machine. ↑ Vandalisation of Buddha's Statue at Mustafapur (Nalanda) Archived 8 November 2017 at the Wayback Machine. ↑ Jinah 2013, p. 52. ↑ "Five of the Leaves from an Ashtasahasrika Prajnaparamita Manuscript". Asia Society. Archived from the original on 14 July 2014. Retrieved 25 September 2014. ↑ "Astasahahasrika Prajnaparamita Sanskrit palm-leaf manuscript". Archived from the original on 2 April 2014. Retrieved 25 September 2014. ↑ Nalanda Museum item-30 Archived 1 December 2017 at the Wayback Machine. ↑ Nalanda Museum item-28 Archived 1 December 2017 at the Wayback Machine. ↑ Nalanda Museum item-31 Archived 1 December 2017 at the Wayback Machine. ↑ "Getting to Nava Nalanda Mahavihara (NNM), Nalanda". Nava Nalanda Mahavihara. Archived from the original on 5 October 2014. Retrieved 25 September 2014. ↑ "Welcome to Nava Nalanda Mahavihara (NNM)". Nava Nalanda Mahavihara. Archived from the original on 15 September 2014. Retrieved 25 September 2014. ↑ Singh, Santosh (1 September 2014). "Nalanda University starts today with 15 students, 11 faculty members". The Indian Express. Archived from the original on 4 September 2014. Retrieved 3 September 2014. ↑ "Sushma Swaraj inaugurates Nalanda University". Economic Times. 19 September 2014. Archived from the original on 16 October 2017. Retrieved 19 September 2014. ↑ 117.0 117.1 "Nalanda University reopens". Times of India. 1 September 2014. Archived from the original on 10 September 2014. Retrieved 10 September 2014. ↑ Chatterjee, Chandan (1 September 2014). "Nalanda route to prosperity — Varsity will boost trade, feel residents". The Telegraph. Archived from the original on 10 September 2014. Retrieved 10 September 2014. ↑ "The Archaeological Museum, Nalanda". Archaeological Survey of India, Government of India. Archived from the original on 11 September 2014. Retrieved 10 September 2014. ↑ Chaudhary, Pranava K (27 December 2006). "Nalanda gets set for relic". Times of India. Archived from the original on 6 November 2015. Retrieved 10 September 2014. ↑ "Nalanda Multimedia Museum". Prachin Bharat. Archived from the original on 4 March 2016. Retrieved 10 September 2014. Minhaj-ud-Din, Maulana (1881). Tabakat-i-Nasiri – A General History of the Muhammadan Dynasties of Asia Including Hindustan. Translated by Major H. G. Raverty. p. 552. Dutt, Sukumar (1962). Buddhist Monks And Monasteries of India: Their History And Contribution To Indian Culture. London: George Allen and Unwin Ltd (Reprinted 1988). ISBN 81-208-0498-8. Chandra, Satish (2004). Volume 1 of Medieval India: From Sultanat to the Mughals. Har-Anand Publications. ISBN 8124110646. Ghosh, Amalananda (1965). A Guide to Nalanda (5 ed.). New Delhi: The Archaeological Survey of India. Scharfe, Hartmut (2002). Education in Ancient India. Handbook of Oriental Studies. 16. Brill. ISBN 9789004125568. Basham, A. L. (1954). The wonder that was India: a survey of the history and culture of the Indian sub-continent before the coming of the Muslims. London: Picador. ISBN 978-0330439091. Chos-dar, Upasaka (1959). Biography of Dharmasvamin (Chag Lo Tsa-ba Chos-rje-dpal), a Tibetan Monk Pilgrim. Translated by George Roerich, Introduction by A.S. Altekar: The account was narrated by Dharmasvamin to his student, Chos-dar. Altekar, Anant Sadashiv (1965). Education in Ancient India. Nand Kishore. ISBN 8182054923. Rene Grousset (1971) [First published in French in 1929]. In the Footsteps of the Buddha. Translated from French by JA Underwood. Orion Press. ISBN 0-7661-9347-0. Joshi, Lal Mani (1977). Studies in the Buddhistic Culture of India During the Seventh and Eighth Centuries A.D. Motilal Banarsidass Publications. ISBN 8120802810. Wriggins, Sally Hovey (1996). Xuanzang : a Buddhist pilgrim on the Silk Road. Boulder, Colo.: Westview Press. ISBN 0-8133-2801-2 – via Questia. (Subscription required (help)). Wink, André (2002). Al-Hind : the making of the Indo-Islamic world, Volume 1 ([3rd ed.]. ed.). Boston, MA: Brill. ISBN 0-391-04173-8 – via Questia. (Subscription required (help)). Sharma, Suresh Kant (2005). Encyclopaedia of Higher Education: Historical survey-pre-independence period. Mittal Publications. ISBN 8183240178. Khurshid, Anis (January 1972). "Growth of libraries in India". International Library Review. 4 (1): 21–65. doi:10.1016/0020-7837(72)90048-9. Sastri, Hiranand (1986) [First published in 1942]. Nalanda and its Epigraphic Material. New Delhi: Sri Satguru Publications. ISBN 8170300134. Sastri, Kallidaikurichi Aiyah Nilakanta (1988) . Age of the Nandas and Mauryas (2nd ed.). Motilal Banarsidass Publishers. ISBN 812080466X. Taher, Mohamed; Davis, Donald Gordon (1994). Librarianship and library science in India : an outline of historical perspectives. New Delhi: Concept Pub. Co. ISBN 8170225248. Bhatt, Rakesh Kumar (1995). History and Development of Libraries in India. Mittal Publications. ISBN 8170995825. Mookerji, Radha Kumud (1998) [First published in 1951]. Ancient Indian Education: Brahmanical and Buddhist (2 ed.). Motilal Banarsidass Publications. ISBN 8120804236. Patel, Jashu; Kumar, Krishan (2001). Libraries and Librarianship in India. Greenwood Publishing Group. ISBN 9780313294235. Collins, Randall (2000). The sociology of philosophies: a global theory of intellectual change. Volume 30, Issue 2 of Philosophy of the social sciences. Harvard University Press. ISBN 978-0-674-00187-9. Beal, Samuel (2000) [First published in 1911]. The life of Hiuen-Tsiang. Trubner's Oriental Series. 1 (New ed.). London: Routledge. ISBN 9781136376290. Humphreys, Christmas (1987). The Wisdom of Buddhism. Psychology Press. ISBN 0700701974. Wayman, Alex (1984). Buddhist Insight: Essays. Motilal Banarsidass. ISBN 8120806751. Kulke, Hermann; Rothermund, Dietmar (2004). A History of India (Fourth ed.). Routledge. Monroe, Paul (2000). Paul Monroe's encyclopaedia of history of education, Volume 1. Genesis Publishing. ISBN 8177550918. Walser, Joseph (2005). Nāgārjuna in Context: Mahāyāna Buddhism and Early Indian Culture. Columbia University Press. ISBN 023113164X. Le, Huu Phuoc (2010). Buddhist Architecture. Grafikol. pp. 58–66. ISBN 0984404309. Frazier, Jessica, ed. (2011). The Continuum companion to Hindu studies. London: Continuum. ISBN 978-0-8264-9966-0. Jarzombek, Mark M.; Prakash, Vikramaditya; Ching, Francis D.K. (2011). A Global History of Architecture. John Wiley & Sons. ISBN 0470902450. Kim, Jinah (2013). Receptacle of the Sacred: Illustrated Manuscripts and the Buddhist Book Cult in South Asia. University of California Press. ISBN 0520273869. Walton, Linda (2015). "Educational institutions" in The Cambridge World History Vol. 5. Cambridge: Cambridge University Press. ISBN 978-0-521-19074-9. Tabakat-i-Nasiri – A General History of the Muhammadan Dynasties of Asia Including Hindustan by Minhaj-i-Siraj (translated by Major H. G. Raverty), p. 552. This article includes content from Nalanda on Wikipedia (view authors). License under CC BY-SA 3.0.